10 two-person teams travel from Rio to Buenos Aires on the second leg in a race around the world. This episode feature strategic phone borrowing, cardboard gathering, personality conflicts, navigational skills, the expectation that random cab drivers care deeply if you win the Amazing Race, statue toting, polo, resource limitation, tangoing up the walls, arrogance, a hamstring pull, flirting with the greeter, and some early ground staked out in the Worst One in The Pairing stakes. Okay last thread I said I didn't feel strongly about any teams. I've changed my mind. I can't decide whose face I want to punch harder: green team guy, or Texas guys. Also when James Earl was talking about how he and his mom had been distant and she hadn't really accepted him yet i said to my husband "yeah, until he totally rocks some dance challenge." What were the obviously-planted cardboard pieces supposed to be? My guess is they were made for shipping a specific piece of equipment or an accessory or component, and the item didn't sell as well as expected, leaving lots of cardboard the show bought in bulk? They definitely did look seeded, though. I also assume the producers paid the regular cartoneros to take the day off. Both the Team Texas and the Green Team are eminantly dislikable. I find Team Texas's strong hatred of Justin makes me want to like Justin, but then Justin is on the screen and I just can't. 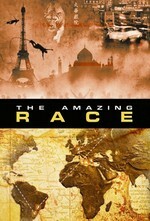 I must give kudos to the Amazing Race for casting someone who ticks both boxes of superfan and arrogant know-it-all. And I think he thinks he's gonna be the fan favorite. I was sad to lose the cousins this week, but happy that the dancers and the track stars both made it through. I think I'm rooting for the dancers right now. I like they way they play the game, interact with each other, and their good humor. And surprisingly, I don't hate the reporters - or the paparazzi. The Texas guys are assholes. Justin is annoying, but he's a superfan finally living out his fantasy, and I'm a bit more willing to give him the benefit of the doubt for now. Of course the cardboard was pre-staged by the producers. All of the roadblocks like that have been very elaborately planned in advance by the producers. The Mr. and I are certain that the Texas guys are repressed Christian gays who are totally in love with each other, based on their body language together (not to mention the one guy's obsession with hair gel).